What is Puttanesca, you might ask? I found myself wondering the same thing when I was flipping through “The Everyday Squash Cook” by Rob Firing, Ivy Knight, and Kerry Knight. This Canadian cookbook covers many uses for squash and includes vegetarian, vegan, and omnivorous dishes. It wasn’t until I had made the recipe that I discovered that puttanesca apparently means whore, so this dish translates to Spagetti Squash made by a whore…. I don’t find that very flattering, but the dish is great. Spaghetti Puttanesca is traditionally tangy, made with olives and capers. The exciting part about this cookbook is learning tips for cutting squash. I had a bad experience while I was at Cordon Bleu, when I was doing my 4 hours of “sous-chef-ing” for their signatures restaurant. I was involved in the prep, and was told to cut 3-4 GIANT squashes in pieces (the squashes were at least a foot long each ). I had such a hard time getting the knife to pierce into the squash, let alone get it to move. Long story short, another chef eventually helped me, but I really could have used the tips from this cookbook back then. Here is the recipe – keeping in mind that I report on my blog what I did, so the recipe is often at least a bit different than the original recipe. I like to do things like double garlic and herbs/spices. First I cooked the squash. I preheated the oven to 400*F. I cut a small piece off of one face of the squash so that I could place the squash on it’s back and not have it roll. 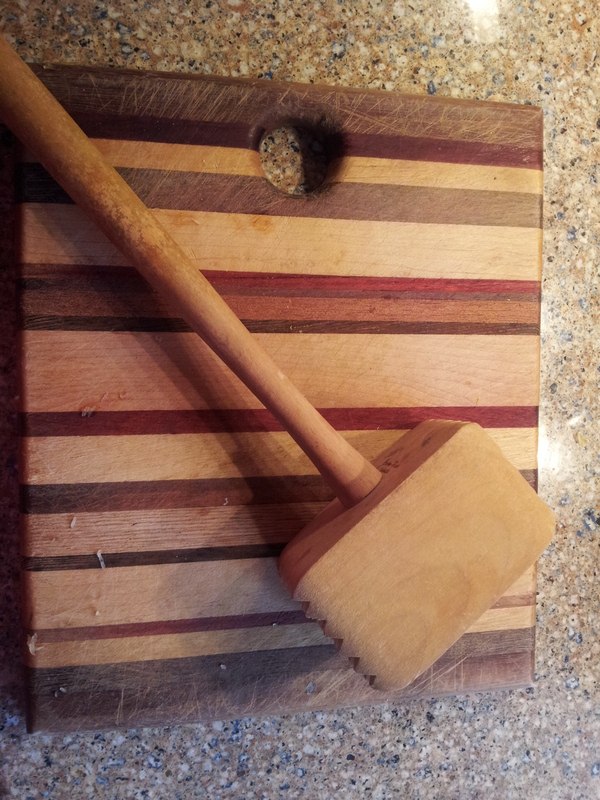 Next, I cut the squash in half length-wise by piercing the squash, then hammering the knife with a meat tenderizer (aha! one of these does come in handy in vegan cooking! ), which let the blade cut while I hammered. I made sure to hammer the flat part of the blade, rather than a handle. If it wasn’t obvious, a big knife is necessary here. Next, I scooped out the guts with a spoon. I lightly oiled the exposed flesh and placed each half face-down onto a cookie sheet. The squash was baked for 20 minutes, until a fork inserted easily. Depending on the size, the squash may need about 5-8 extra minutes. The squash cooled for about 10-15 minutes, and I pulled out all the flesh with a fork, dragging it long-wise down the squash, and letting the noodles fall into a large bowl. I set the squash aside. In a medium sauce-pan, I heated some olive oil and sauteed the onion until soft, then added the garlic for one minute. I added the tomato sauce, olives, capers, basil, hot pepper flakes, and salt and pepper, and let the sauce simmer for 20 minutes, stirring occasionally. I re-heated the noodles in a non-stick frying pan, and served the tomato sauce on top of the noodles. I served this dish with a spinach salad and a baguette. Sarah cooked this in our kitchen on Monday and it was indeed delicious. 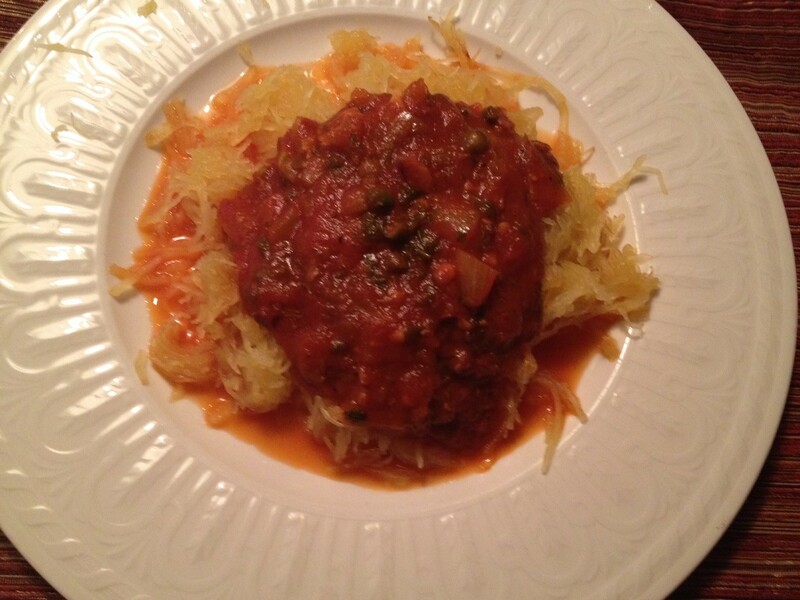 It’s amazing how the squash, once it’s cooked, takes on the appearance and structure of cooked spaghetti noodles. You should have seen Sarah swinging that hammer to cut the squash up! And the sauce is tangy and delicious.